Hello gamers, looking for a new weapon? Flipkart is currently hosting the Republic Day sale and is offering attractive discounts, bank offers, card offers and no-cost EMIs on several products including smartphones, electronics, fashion and furniture. Earlier, we had covered the best deals on smartphone and laptops, and now, we have something exciting for the gamers. In this post, we have covered some of the best offers on gaming laptops being offered by Flipkart. The laptops are from companies such as Alienware, Asus, MSI and Dell. The Flipkart Big Shopping Days end on 23 January. The Acer Predator Helios 300 series is currently available for Rs 66,990. It comes with a 15.6-inch display, a seventh generation Intel Core i5 and i7 processor, 8GB DDR4 RAM, a 1TB hard drive and a 128GB SSD. 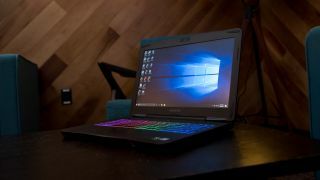 The graphics on the laptop are handled by NVIDIA GeForce GTX 1050 Ti and it runs on Windows 10 Home. The Alienware 15 comes with a 15.6-inch display, a seventh generation Intel Core i7-7700HQ processor, 8GB DDR4 RAM, a 1TB hard drive and a 256GB SSD. It runs on Windows 10 Home and comes with NVIDIA GeForce GTX 1060 for graphics. The MSI GV62 7RD-2297XIN comes with a 15.6-inch display, a seventh generation Intel Core i7-7700HQ processor, 8GB DDR4 RAM and a 1TB hard drive. The machine also comes with the NVIDIA GeForce GTX 1050 for graphics and runs on DOS. The Asus FX553VD-DM013T comes with a 15.6-inch display, a seventh generation Intel Core i7-7700HQ processor, 8GB DDR4 RAM and a 1TB hard drive. It comes with NVIDIA GeForce GTX 1050 for graphics and runs on Windows 10 Home. The Asus ROG GL553VD-FY130T comes with a 1v5.6-inch display, a seventh generation Intel Core i5-7300HQ processor, 8GB DDR4 RAM and a 1TB hard drive. The graphics on the device are handled by NVIDIA GeForce GTX 1050 and it runs on Windows 10 Home.